In the coming weeks, the Senate will consider putting $5 million toward a new State Paid Leave Fund, which President Obama has proposed in his last three budgets. The Fund would help states that want to start paid leave insurance programs for workers and their families. Five million dollars might not sound like a lot — especially when you consider the size of our multi-trillion-dollar federal budget — but these funds are critically important and could really help build momentum in the states. We all know how important it is for families to have access to paid leave when illness strikes or babies come, and that’s why we need you to contact your senators today. 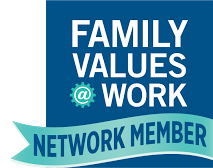 Please urge your Senators to contact their colleagues on the Labor-HHS Appropriations subcommittee and voice their support for the State Paid Leave Fund. As the Supreme Court’s decision on the Affordable Care Act draws closer we wanted to remind you of some of the things women stand to gain from the ACA as highlighted by the Center for American Progress. 1. The ACA guarantees coverage of preventive services with no cost sharing. Under the health reform law, insurers are now required to cover recommended preventive services such as mammograms, Pap smears, and well-baby care without cost sharing. More than 45 million women have already taken advantage of these services. And starting this August more services, including contraception, gestational diabetes screening, and breastfeeding supports, will be added to the list of preventive care that must be covered at no additional cost. 2. Maternity care will be required in new insurance plans. Once is fully implemented in 2014, about 8.7 million women will have guaranteed access to maternity care in all new individual and small group plans. Yesterday PathWays PA joined with other advocates outside the Media Court House to urge state legislators to restore some of the devastating cuts that are being proposed. There is so much going on right now that we did not want to miss an opportunity to update you even on issues that are not budget related. Please see our recent blog posts on Ending Human Trafficking in Pennsylvania and the Paycheck Fairness Act. In early May, the Pennsylvania Senate approved a 2012-13 budget plan (SB 1466), spending about $500 million more than the Governor proposed. The House is expected to vote on SB 1466 the week of June 4th. Yesterday the House Appropriates Committee passed SB 1466 out of committee. There is a spend ceiling of $27.6 billion and House members are asked to keep any amendments revenue neutral. This has upset some members who are seeking amendments based on the findings of the Independent Fiscal Office that there is an additional $300 million the state has access to. In the next few weeks, we expect a vote on the Paycheck Fairness Act. The vote could come at any moment, so we need you to contact your Senators today. Please tell your Senators to show their support for equal pay by co-sponsoring the Paycheck Fairness Act. What would the Paycheck Fairness Act do? The Paycheck Fairness Act would deter wage discrimination by closing loopholes in the Equal Pay Act and barring retaliation against workers who disclose their own wages to co-workers. Without this bill, employers can penalize and even fire employees for talking about their salaries. This egregious practice leaves workers in the dark, preventing them from ever finding out about pay discrimination in the workplace. Please take 2 minutes to tell your Senators to support equal pay by co-sponsoring the Paycheck Fairness Act. The last time the Senate voted on the Paycheck Fairness Act it fell just a few votes short of moving forward. URGENT ACTION NEEDED: Please Help Us End Human Trafficking in Pennsylvania! Human trafficking is a form of modern day slavery, which overwhelmingly impacts women and girls. It is the fastest growing crime in the world and is a crisis taking place right here in Pennsylvania. The National Human Trafficking Resource Center Hotline Notification Act (HB 235) is a bill that would assist victims of human trafficking by requiring key establishments to post the toll-free 24-hour hotline number so victims can call for help. The posting of the hotline will provide access to help for victims and act as an outlet for tipsters. Identifying victims and providing a centralized venue for reporting tips is the key to enforcing the law and uncovering this hidden crime. House Bill 235 is moving quickly and is expected to be voted on by the full House of Representatives TODAY. We need to act fast to ensure our State Representatives vote in favor of this life-saving bill! On April 17th, we honored Equal Pay Day – the day where a women’s salary will equal that of a man’s from the previous year. Now, one month later, we need your help to take action in support of equal pay. 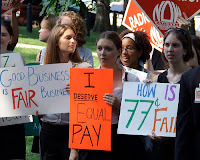 In the next few weeks, we expect the Senate to vote on the Paycheck Fairness Act. The vote could come at any moment, so we need you to contact your Senators today. Ask your Senators to show their support for equal pay by co-sponsoring the Paycheck Fairness Act. While women make up more than half of the workforce and more than 2/3 of them are their families’ principal breadwinners, women still earn on average only 77% of what their male counterparts do. Women need fair wages that will allow them and their families to be economically secure and the legal recourse to ensure they can. Great News! Equal Pay for Equal Work Might be a Reality Soon! We just received great news from MomsRising! 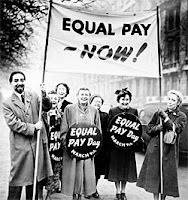 Just weeks after Equal Pay Day, when thousands of women spoke out for equal pay for equal work, soon the U.S. Senate will likely bring the Paycheck Fairness Act up for a vote! Even though the Equal Pay Act was passed in 1963, the fact is that in 2012 women are still paid less than men are for doing the same job. The U.S. Census found that women who worked full-time, year-round on average still made 23 cents less for every dollar earned by their male counterparts. Earlier this week we asked you to take action to urge your Representative not to weaken the Violence Against Women Act (VAWA). While the bill that passed the Senate extended protections, the House bill that did pass yesterday rolls back protections as it discourages undocumented immigrant women from reporting abuse without the threat of being deported. It also makes it harder for Native American women to seek justice against their abusers, and it leaves out protections for the LGBT community. The House bill marks the first time that the VAWA’s protections have been reduced! Even though the House and Senate have both passed bills, our voices can still be heard! The Senate and House will likely have to reconcile the difference in the bills passed through a Conference Committee. Did you know that in Pennsylvania it's legal to charge women more than men for health care?? Health insurance companies say it's because women can have babies, but a woman is likely to be charged discriminatory rates throughout her entire life. And in Pennsylvania, health insurance companies are not required to cover pregnancy. The new health care law ends this and bans insurance companies from counting pregnancy as a 'pre-existing condition.' But, those protections don't go into place until 2014. Women can't wait! Sign the petition. Tell your legislators to give these protections to Pennsylvania women now. Whatever the Supreme Court decides, women in Pennsylvania deserve these protections! Join PHAN’s Tuesday Night Policy Call Series on June 5th at 6:00 to find out the latest around legislation in Pennsylvania to do just this! This call will feature Erin Cusack of Maternity Care Coalition. RSVP here. "significantly reducing the number of Erie County households living below a self-sufficiency benchmark calculated by PathWays PA, a state nonprofit organization. The self-sufficiency standard takes into account categories such as food, housing and utilities, transportation, child care, health-care costs, and miscellaneous items like clothing, medications and other basic needs. According to PathWays PA, the self-sufficiency mark in Erie County for a family of four is $53,077, more than two times the federal poverty rate of $22,050." When we last calculated how many families lived below the Self-Sufficiency Standard (in 2009), we learned that 30,000 families in Erie County alone were below the Standard. Senate To Vote on Budget Proposals Today! Remember last week, when the House voted (and passed) a budget that cut Medicaid, SNAP (food stamps), education, housing, environmental funding, etc.- all while cutting approximately $10 Trillion in taxes over 10 years? Today is the Senate's turn - which means that it is your turn to let the Senate know how you feel about the budget bill. The bill passed by the House of Representatives will over a decade, cut $5.3 trillion from almost every domestic program, including Medicaid, SNAP/food stamps, the Affordable Care Act, education, environment, child care, housing, and more. About two-thirds of the cuts hit low-income people hard. It would permanently strangle the ability of Medicaid and SNAP to respond to economic slumps by turning these programs into block grants with restricted funding. It proposes substantial cuts to Medicare that would kick in after the first ten years. The US House of Representatives is expected to vote on its version of the Violence Against Women Act (VAWA) Reauthorization Act this week, as early as tomorrow. The House version (H.R. 4970) will weaken many vital improvements contained in the recently passed Senate VAWA bill (S. 1925) and in turn will have distinct negative impacts on the ability of many survivors to be safe and economically secure. You don't have to be a budget expert to talk with legislators. Join Sharon Ward for a webinar on how to successfully make the case to legislators that the state has the resources to adequately fund services for children, people with disabilities, victims of domestic violence, and families and communities struggling with the impacts of the recession. Get the facts on the state's revenue picture, and viable options for bringing in new streams of sustainable revenue (some of which the Governor himself is promoting) Learn messaging tips to make your case succinctly and effectively Talk about how to field common responses from legislators There will be plenty of opportunities for questions, sharing your own experiences, and individual troubleshooting. To join call conference line number: (760) 569-7676 and enter the code: 453547. Please be sure to RSVP. From our friend at the Better Choices for Pennsylvania Coalition. PathWays PA hope that all moms had a Happy Mother’s Day! Enjoy this Mother’s Day Fantasy Video put together by MomsRising. Last week the U.S. House of Representatives passed H.R. 5652, the Sequester Replacement Reconciliation Act. 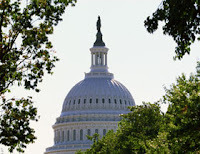 The bill would replace the automatic defense cuts scheduled to go into effect beginning in January, 2013 under sequestration with $72 billion in cuts in the coming year to non-defense programs. Warning: Getting Pregnant May Get You Fired! From our friends at 9 to 5. In 2012, getting pregnant can still cost you your job. Because of loopholes between discrimination and disability laws, employers are refusing to accommodate even simple requests that help workers maintain a healthy pregnancy. This week, the Pennsylvania Senate released its numbers on the state budget. In their version, the Senate restores $500 million in funding, including restoring funding for Pennsylvania's colleges to its current levels. While overall funding increased, The Philadelphia Inquirerreported that attempts "to put in another $250 million for social services, child-care services, and a temporary cash assistance program for poor and disabled adults failed." According to the Pennsylvania Budget and Policy Center, the Senate budget increases spending while continuing a proposed tax cut and cutting a proposed cap on the sales tax vendor discount. This Mother's Day, tell you legislators to insure all Pennsylvania's mothers. Health insurance is absolutely critical to ensuring healthy births. Yet in Pennsylvania, maternity care does not need to be included in individual and small group health plans. Important legislation -- SB 1063 and HB 1957 -- will expand pregnant women's access to insurance in our state and guarantee that pregnancy can no longer be considered a pre-existing condition by insurance companies. Tweet to your Representative or post on their Facebook wall Call your Representative (Find them here) Have you been denied maternity insurance? Post your story on Facebook or Tweet it Don't forget to mention @mccpolicy and use the hashtag #InsureMothersNow. The common cold. Chicken pox. The stomach flu. Besides making you sick and risking your health, these illnesses have something else in common: they could make you lose your job. In Philadelphia, over 200,000 workers have no access to earned sick days when they or their family members come down with an illness. Whether a child is running a fever or a waitress has been hit by a truck door on her way to work, the choice for these employees is the same: to either put someone's health at risk or to jeopardize their own economic security. Support Self-Sufficiency for Homeless Women and Families! PathWays PA has been caring for homeless women and children for 34 years. With the recent budget cuts this service is being threatened. Help us care for these women and their children by making a donation today. Between now and June 30th, we need to raise $20,000 to continue to provide safe and stable living conditions for these families! PathWays PA helps over 6,000 low-income women, teens, children and families achieve economic self-sufficiency and family well-being. Our homeless shelters provide clients with an opportunity to avoid foster care placement for their children by providing families with a stable living environment—sometimes for the first time in their lives. Many of the women and children who reside in our residential programs lack basic living essentials, such as food, clothing, shelter, furniture, personal hygiene items, and school supplies.